‘Tis the season for giving, and that means lots of gifts. In fact, when Christmas rolls around, there are 4 things we spend a great deal of time on – cooking, shopping, decorating, and wrapping gifts. Wrapping takes a great deal of our time, and the cost of Christmas wrap can be daunting. Even more disturbing is the amount of trash that piles up when the presents are unwrapped Christmas morning. Have you ever looked at the pile of torn and tattered bows, gift wrap and bags after the tradition of opening gifts is complete and wondered just how much trash is produced every year, simply through opening presents? If so, you are not alone. It’s a huge disaster, and you may feel like it’s an even bigger waste. Think how much money and materials could be saved if only wrapping paper weren’t such an important part of the process. In addition to wasting paper, think of all the chemicals that go into the coloring and making the paper shiny. It’s extremely unhealthy for the environment, both in the manufacturing process and in the way it stacks up in a landfill. You can’t even be certain that the wrapping paper is biodegradable. This year consider some eco-friendly Christmas wrapping ideas that are great alternatives to the standard and do your part to feel better about conserving supplies and preserving our environment. Everyone wants to do better to reduce their negative impact on the environment, but a lot of people aren’t sure where to start. In terms of taking the theory of being more eco-friendly and making it a reality, it’s easier said than done. You walk through all the retail stores and are inundated with the commercialism of Christmas, presented with so many beautiful wrapping options, and feel the need to get something that shows your personality, resonates with kids and family, and makes you feel the Christmas spirit. It’s almost impossible to walk away. You also want your wrap jobs to look sophisticated and neat. Thinking about ‘going green’ doesn’t exactly inspire thoughts of grandeur. 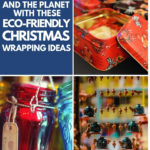 But there are tons of options available for eco-friendly Christmas wrapping that are simple and easy to put into practice, and with these ideas, you can certainly find one that works for you, giving you the satisfaction you desire in terms of beauty while also taking care of the world we live in. More than the paper itself is involved in the wrapping process. Think of all the bows and ribbons that are thrown into the mix for decoration. These, too, take a lot of work to create and stop up the landfill. So, looking into recyclable options for décor can really reduce the amount of trash you’ll have to bag and send away. It also reduces the demand on the environment for supplies and on manufacturing that releases harmful chemicals into the air. So, you may have relatives that appreciate gifts bought in antique shops. In fact, this may be a regular outing for you when it comes to shopping for Christmas gifts. You’ve found little trinkets and collectibles that have really sparked gratitude from those relatives, and it’s been a simple solution to buying for individuals who are harder to shop for. But you have other uses for these shops as well. You can also sort through the ‘junk’ and find a lot of interesting materials that can work for wrapping and decorations on the presents you’re handing out. If you’ve never been in an antique shop, don’t panic. You aren’t alone, and there is plenty to discover. Take a look around one before you start trying to actually shop, and get a feel for the place. Then, you’ll be ready to dive in. It doesn’t have to be a frightening or overwhelming task if you’ve taken the time to familiarize yourself with the layout and the opportunity surrounding you in an antique shop. First of all, there are small shops like this in every town and city, and most of them are in a specific area, where they are lined up next to each other, making your hunt for buried treasure easier to manage. Also, you should realize that, while there are a few things worth a pretty penny in these shops, most of what you’ll find are inexpensive hand-offs that people don’t need any more and have put up for sale on consignment, with very small price tags, just to clear the clutter. Instead of spending money on those thin, generic cardboard gift boxes, put your gifts in old cookie tins and jars. Not only are these unique; they are recyclable and make great storage for other things, whether they are handed back to you or kept by the person who opens the gift. Old maps make interesting wrapping paper or even replace the tissue paper you would stuff in a bag, and they can be framed or kept for home décor. Vintage cards are great ‘to/from’ notes, and they cost pennies. Brooches and such are much more interesting than shiny bows, and these can be additional gifts for your beloved family member as well. The same is true of ornaments, which can be cut apart and used as décor or even hung in a place of newly purchased items on your tree. Towels and scarves make great gift wrap and can be used in the future for their originally intended purpose. None of this will cost much – you can typically find brooches and such for under a dollar, and old towels might go for a quarter. It’s fun to look around, and you can even get your children involved in the process. You can also take old, illustrated books that are falling apart and use the pages to create a storytelling gift wrap that is completely one of a kind in its design. Note that, if you’re giving any jewelry, one of the best ways to present it is to give it in a baby food jar. This is a simple, small item that’s easily wrapped with very little material and holds the jewelry safely and beautifully. When it comes to recycling, take a look at what you already have. Are you a crafty person? Chances are you’ve got twine, ribbon, bags, jars, tissue paper, and other odds and ends lying around in a closet that haven’t been used. They may be cast off odds and ends from previous projects that can be pieced together to make one of the coolest gifts wraps under your tree. If you’ve got worn out blankets, these can be used to make tassels or even ‘ribbons’ to tie your presents up in neat little bows. Cut into thin strips and see what sort of creative design inspires you. You could even cut short pieces and turn it into a pompom which would delight a great many children. You may even have some items you received as gifts that you can reuse to make beautiful and creative gift wrap. If your ribbon is kinked, simply iron it to flatten it out and use it to seal up packages – such as those cookie tins – rather than wasting a bunch of tapes. This will save paper and all that tape that goes to waste every year. Okay, we’re not suggesting you go rifling through your neighbor’s garbage can. However, you likely have some trash of your own you can reuse to create a beautifully wrapped gift for Christmas. Consider that shiny, sparkly silver is a favorite color around the holidays. You’ll spend a fortune on gift wrap that’s only going to be disposed of in the end to get that lovely silver. Instead, take a look in your kitchen. Chances are, you and your children have indulged in some sort of chips over the last couple of months. Don’t throw away the empty chip bags! Remember, the inside of a chip bag is silver. Simply turn inside out, wipe down any grease or crumbs, and make use of as many of these as possible. They’re eventually going in the garbage anyway, right? At least get a second use out of them that negates the need for doubling your waste! Do you have old clothes you’re getting rid of, whether intending to donate or simply toss? Stop right there! T-shirts, sweaters, and even jeans can be cut and pieced to make unique fabric gift wrap for various items. Or, you can find interesting ways to tie them around jars and such to make them even more individual and interesting. Do you have old magazines or newspapers lying around that are waiting to be recycled? Push them through one more use. Find some of the best images in your magazines and create a very worldly and exciting Christmas wrap, especially for that pop culture guru in your life, or find the comics in the paper for a child. Use the financial pages for the person who is heavily invested in the stock market and political stories for that liberal or conservative who can’t stop ranting about the current government situation. Places like New York City are a breeding ground for local, sustainable, and ethical makers of materials, but if you do a little research, you can find them in any area of the country. Even if you can’t find one locally, you can get on Etsy and find someone offering locally made wrapping paper and other materials that will help you reduce your carbon footprint during the holiday season. Ethically made scarves, organic tea towels, and other treasures are just some of what you’ll find, and that’s aside from actual wrapping paper. You’ll probably spend less, especially if you can find something locally, and you’ll feel better about your impact – or lack thereof – on the environment. The best part is that most of what you purchase is easily reusable, especially if you want to add that little extra something for someone close to you. Have you considered that florists are often low on business – aside from selling poinsettias – during the winter? That doesn’t mean they don’t have items that could boost your efforts to be more eco-friendly. In fact, you can do them a solid, bringing them additional business that would otherwise go to commercial retail for a bunch of stuff that’s going to end up in the trash and harm the environment. Instead of bows, ask your florist about holiday berries. You can get several sprigs of them to adorn the gifts you wrap for a very small price, and your florist will be more than pleased with the business. Make them smile even more by asking about natural and biodegradable packing materials. Florists typically have a ton of it on hand, and this sure beats the cost – and horrific effects on the environment – of bubble wrap and foam peanuts. Don’t give up at one florist, if you can’t get enough of these items. Spread the love. You’ll find that any florist will be more than happy to help you out, and you’ll head home with a smile on your face because your Christmas wrapping will not only be safe for the environment but also unique and gorgeous. If you’ve never set foot in a craft or art shop, now is the time. Evaluating commercial wrapping paper shows a number of flaws that will lead to negative impact on the environment – the dyes bleeding into the earth, the lack of biodegradable material, the chemicals that give it a shine – just to name a few. However, there are tons of items at an art store that don’t have these issues. For example, you can get plain white or brown paper that has no dye and no chemicals. These may also be available at an office supply store if you are just one of those people who doesn’t feel comfortable around the artsy type, so there are no excuses. Because there is no ‘gloss’ on this paper, you won’t need tape to wrap your gifts because yarn, ribbon, or twine will keep it in place easily. You’ll also find these items readily available in the art store, as well as things like red ribbon and chalk – which can be used to decorate the paper and to label it, so you know to whom it belongs. This option may also work with paper bags you’ve gotten from the supermarket. After all, so many cities have new laws about the use of plastic bags and charging for them that those who haven’t purchased recyclable bags get paper. Even if you don’t have these, you can often purchase them for a nickel, which is an extremely inexpensive way to accomplish your gift wrapping and create your own chalk and charcoal design. If you’re looking for the ‘easy’ solution, in terms of both wrapping and recycling, consider buying reusable gift bags. This is the quickest way to wrap your gifts and, as long as you actually remember to reuse them, they are a great way to save money and reduce the amount of trash produced every year. To keep them looking good and make sure they don’t snag, try flattening a cardboard box and laying them together neatly inside. This also creates a flat profile that can be put against the closet wall, so it doesn’t take up any room at all and can be pulled out easily when it’s time to use it again. One thing about kids – they love to participate in special projects, especially when it means that their project is a feature of some show. That can be the case for Christmas, too. Task your children with creating Christmas artwork. Give them paper, pens, crayons, markers, paint, or any other utensils, and set them to work. Tell them the more, the merrier. Have them make pictures related to the person whose gift you’re wrapping, or tell them to draw or paint what Christmas means to them. Have a contest to see who can make the chubbiest Santa, or who can finish painting all the reindeer first. This is a creative space for you and your children, and it not only produces custom wrapping paper that is more organic; it also promotes family time, creative thinking and design, and the overall Christmas spirit. You’ll find it even brightens your mood. So, you’ve got some breakables you’re wrapping and need to pad them carefully. You don’t want to get bubble wrap or foam peanuts, and you’re low on newspaper and need to save it for wrapping those last few items. You could always get more newspaper, but you’re getting close to the deadline and feel the need to hurry up and finish. It’s time to pop some popcorn. Using popcorn as padding is a great way to make sure your breakables are safe, your materials are eco-friendly, and the scent when your loved one opens the gift is heavenly and reminiscent of Christmas. Got kettle corn? Even better! The sweet smell will fill the room when that gift opens, and it’s full of holiday cheer. On top of that, you’ll get kudos for the creativity, which will make you feel like a genuine genius. This isn’t by any means every option you have available for eco-friendly Christmas wrapping, but it’s a great start. You may find some old sheets that are beautiful but too worn to use, which can make great wrapping material. Or, you may have too many tree ornaments and be able to take a few and use them as décor on your gifts. Looking at trimmings from the paper that was used last year? Cut small squares to use as gift tags, rather than buying new ones. There are so many other ways to create beautiful and unique Christmas gifts and decorations. When it comes to Christmas, it’s easy to fall into a trap. We spend so much time in preparation, between shopping for gifts, decorating our homes, and preparing the meal for the family, that it’s easy to simply throw up your hands and just buy what’s convenient. But when you think about how many people are doing the same thing and the mounds of garbage that are going to ruin our environment, it can make you wince. Even if you don’t do a lot throughout the rest of the year, taking part in the effort to employ some green Christmas wrapping ideas can conserve a lot of energy and remove a lot of waste that would otherwise be toxic to the environment. The best part is, there’s very little effort involved. Most of the things you have to do to comply are already tasks you’re working on, and several of these things are actually easier than trying to buy and wrap tons of gifts. You’ll likely forget a necessary supply – like more tape – and have to run out again to buy it, wasting more time and energy. With these ideas, you can wrap gifts without tape, using supplies you probably already have or can pick up easily when you’re out and about. Best of all, you’ll have an opportunity to involve the rest of the family, not only getting quality time but teaching them about the need for environmental concern. Going green affords you the opportunity to show how creative you can be, how smart it is to conserve, and a means by which you can feel good about your contribution. When you’re giving this Christmas, consider that eco-friendly wrapping options are a way to give to your family and friends and to give back to the environment.